These mature vertical wells, which have been producing for nearly 40 years, are located in the carbonate Swan Hills Formation in Canada, and had a slight tendency to accumulate scale near the wellbore. 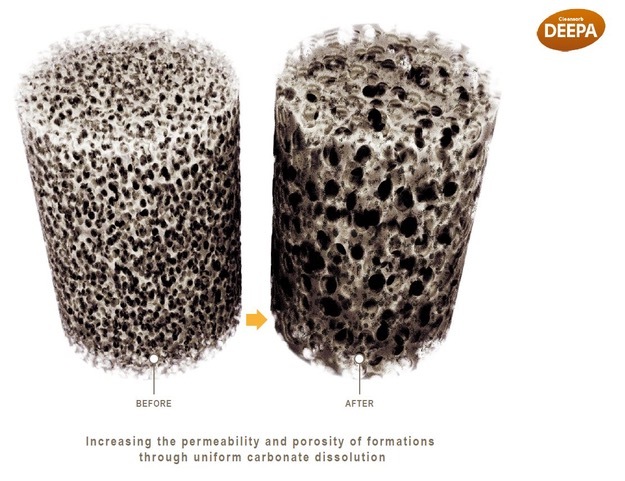 "To address this issue and enhance production, the customer wanted to investigate novel approaches to treat their assets, so opted to treat them with DEEPA, which we developed to dissolve scale and enhance matrix permeability of the rock," said Ian McKay, Director & Co-founder of Cleansorb. DEEPA, which delivers organic acid deep into the rock matrix via in-situ acid generation, increases permeability uniformly around the wellbore. To treat the Swan Hills Formation wells Cleansorb, and its local partner, formulated a custom DEEPA treatment suitable for a bottom hole static temperature of 90-110 C (194-230 F), which was then administered. Following a brief 24-hour shut-in period to allow the treatment to dissolve the scale and penetrate the rock, production in each well rose by 200-250%, and remained at that level. This result exceeded the customer's expectations. "The proof lies in that extraordinary production improvement of 250%," said the Vice President of Operations & Technology for the operating company. "DEEPA doesn't let us down." Since the initial wells were treated in the carbonate Swan Hills Formation, similar results were achieved when applied to mature wells located in sandstone formations containing 5-10% carbonate. Over time, approximately 30 mature wells in Canada have been successfully treated with DEEPA. "Because every well is different, every well will respond differently. That said, doubling production following treatment with DEEPA is not out of the ordinary," said Ian McKay. "In this case, there was a very slight scaling tendency, so the wells had accumulated scale throughout their 40-year producing life, which was then cleared with DEEPA. Similar production improvement is certainly achievable on other mature fields with long-term scaling issues, once treated with DEEPA. It's a very simple, straightforward way to revitalize production, effectively extending the life of a field that might have otherwise been slated for decommissioning."